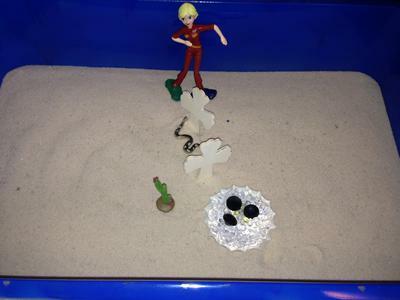 (Mercer University ) Jungian Shadow Sand Tray TherapyThis sand tray for my sand tray therapy class is a representation of the dark parts of myself; the parts that make me angry. I have depicted in my sand tray the fact that I often feel pulled between the good and the bad parts of myself. The good parts of me are represented with the cross for spirituality and the clear jewels. I feel like I’m am constantly caught between who I used to be, temptation to do things that are wrong but feel good, and who I know God created me to be. I am at heart a good mother, wife, and counselor, but I have those dark parts that creep into my spirit that I often keep suppressed because these dark parts of myself will only cause pain and trouble and they are represented by the black diamonds and the snake. The snake is constantly creeping around looking to strike and then slither away as if has nothing happened. Sometimes I am afraid of this dark side; afraid that I will enjoy some of the things that are bad but feel good and that I will be caught in a web of darkness and I will be pulled away from who God intended for me to be. Part of my darkness is my impulsivity which is represented by the cactus. I know that if I touch the cactus I will be poked and possibly harm myself, but I just feel the need to touch it any way and take a chance that I will not be harmed and will only know the pleasure of touching the cactus. The lady in the sand tray is me, she has cars on her feet with wheels, which often make me feel like I am unbalanced and walking a tight rope. I am attempting to stay on the side of good and doing what is right as opposed to doing what feels good regardless as to whether or not it is right. This is my first time openly talking about my dark parts outside of journalist which I don’t share with anyone. This has been helpful in allowing me to process outwardly what I know inwardly. My goal is to continue to work on all parts of myself.